The Stags average 47.3 points and more than 500 yards of total offense per game. Last week, Bishop Miege scored 63 points and gained 558 yards during a win over Eudora. Class 4A Division I's Stags should be ready to play this week when they face second-ranked undefeated De Soto. Marysville caught the attention of the state with a season-opening 52-13 rout of three-time defending champion Rossville. In that game, senior quarterback Jack Blumer passed for 313 yards and six touchdowns. It was just an introduction of things to come for Blumer, who has enjoyed a breakout season for the 6-1 Bulldogs. The 6-foot-2, 170-pound Blumer has completed 72 percent of his passes this season for 1,729 yards and 20 touchdowns with just two interceptions. Blumer has also added 526 yards on the ground at a clip of 8.5 yards per attempt. He’s added ten rushing touchdowns. Marysville has one blemish on its record, a 22-16 setback at Concordia back in Week 4. The Bulldogs opened district play with a 56-28 victory at Beloit last week. This week, Marysville hosts a Minneapolis (2-5) team that has given up an average of 29 points per game, but has surrendered 53 points twice in the past three weeks. Jackson may be one of the best athletes in Kansas. He likely won’t be a quarterback at the next level, but he is playing one for Lawrence and head coach Dirk Wedd. Wedd, who has been around football for 40 years, tells us that he is one of the best athletes he has ever seen and may be the best dual-threat in the state this year. Jackson, who stands just 5-foot-7 and weighs 160 pounds, is a human joystick on the field and has over 1,700 yards combined (passing/rushing) this year in just six games, missing week one. He has 4.4-4.5 range speed with a 43-inch vertical. Yes, you read that right. He will need the biggest game of his life this week if they are able to upset the top-ranked Free State Firebirds. Calling Brent Peavler a tackling machine is, well, calling it like it is. Last year, Hayden’s standout linebacker racked up a whopping 172 tackles with 68 of those solo stops. He also led the Wildcats with 11 sacks, 5 tackles for loss and 4 forced fumbles. This year as a senior, Peavler has been just as good if not better with 106 tackles through seven games, including 50 solo stops. Friday’s matchup should allow Peavler plenty of opportunities to add significantly to that total as Holton and its run-heavy offense comes to town. The Wildcats spend a lot of time between the tackles where Peavler will be waiting and last year in two games against Holton, Peavler had 36 total tackles, including a monster 24-tackle game in district play. Petz has been the workhorse for the Thunder offense this season. The 6-foot, 200-pound senior captain has rushed for 835 yards and 13 touchdowns on 149 carries this season. Petz averages 5.6 yards per carry and 119 yards per game in arguably the state’s best conference. He has delivered five 100-yard games including a 202-yard, 5-touchdown performance in St. James’ 35-28 win over Blue Valley in Week 5. This week, Petz and the Thunder wrap up the regular season at Blue Valley West on Thursday night. While the Jaguars are coming off of their first win of the season last week over Gardner-Edgerton, but allow nearly 48 points per game. After compiling more than 2,000 yards of total offense and 33 touchdowns as a dual-threat quarterback last season, Salas has made the switch to running back this fall and picked up where he left off. Through seven games the junior has rushed for 936 yards and 11 TDs on 70 carries – an average of 13.4 yards per carry - while also catching 11 passes for 161 yards and two more scores. One of those scores touchdown catches came last week in a loss to 8-Man power Spearville, the Indians first loss of the season. This week Satanta plays host to Ness City in what should be one of the more evenly matched contests in 8-Man Division I. If the Indians are to deliver a win against Ness City and remain alive for a playoff berth, Salas will be the catalyst. Price missed a couple of games in the middle of the season after suffering a high ankle sprain, but the senior returned last week for the start of district play and made his presence felt in a big way. 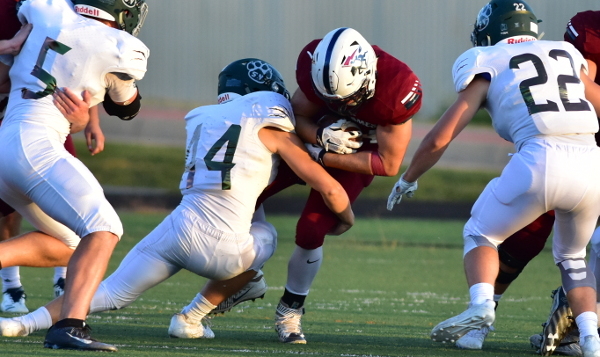 Price scored four touchdowns and compiled nearly 300 yards of total offense in Mulvane's 40-14 victory over Wellington. The Wildcats can all but lock up a playoff berth with a victory this Friday over Wellington, so I expect Price to be in store for a big game. West Elk has started the season with five consecutive wins for the third straight year and is looking to complete a second perfect regular season in the last three falls. The Patriots have been dominant with every win by the 45-point margin except for a marquee 36-22 road victory against St. Paul in Week 6. The 7-0 Patriots have outscored teams 340-50 with a top-seven offense and the second-best scoring defense in Division I. While senior dual-threat quarterback Cade Miller has rightfully earned plenty of attention, junior William Silvey has emerged as a great compliment. He has 72 carries for 488 yards and six scores, all second-best to Miller. Silvey leads the Patriots with eight catches for 250 yards and is second with three receiving scores. Silvey has tallied at least one touchdown in the last three weeks. Last Friday in a key 48-8 win versus Sedan, he had 19 touches for 265 yards and three scores. In 2016, Silvey had 23 touches for 300 yards and three TDs all year. This week, West Elk travels to Moran to take on Marmaton Valley. The Wildcats lost 74-26 to St. Paul last Friday. West Elk is 7-0, 3-0 in District 1 play, while Marmaton Valley stands at 5-2, 2-1. The Patriots can lock up the district with a victory and expect Silvey to again see plenty of touches.